VICTORIA, BC – Life as a high performance athlete requires day-in, day-out strength training, as well as a strict diet and state-of-the art physiological testing. But the skills necessary for success go beyond just the body; having a successful competitive mindset is essential. This is where the Canadian Sport Institute’s (CSI Pacific) mental performance staff come in. CSI Pacific’s mental performance consultants (MPCs) are uniquely trained to identify and diagnose psychological, cognitive, emotional, and behavioural challenges that inhibit an athlete’s ability to perform in the training environment or competition setting. There is no direct path to becoming an MPC. For Dr. Hoar, she has over two decades of field experience, as well as an M.Sc. in Applied Sport Psychology and a Ph.D in Sport and Exercise Psychology. 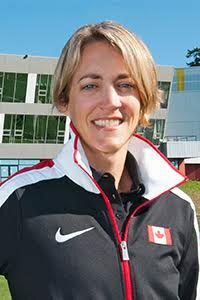 She is also a professional member of the Canadian Sport Psychology Association. With athletes training across the province or competing out of the country for weeks at a time, mental performance consultants have to be flexible to accommodate the needs of different teams and sports. That can mean planning well in advance or having impromptu meetings in coffee shops or over Skype. Based in Victoria, Hoar will monitor the daily training environment of some sports at least one day a week. Other groups will bring her in for a week at a time for training camps or to a more centralized location where most of the athletes are gathering. During that time, Hoar may live with the athletes and coaches to observe sport and non-sport related activities. Building mental performance skills can be essential leading up to a major competition like the Olympic Games. When mental performance staff can’t be with athletes, the coaches and managers can provide support and relieve some of the extra distractions and pressure athletes are sure to face. “The athletes, coaches, sport science and sport medicine teams that I am privileged to work with spend nearly four years preparing,” explained Hoar. “Each year has a unique and specific purpose that leads to continued development and refinement of an athlete’s mental ‘game’ or fitness. The mental performance team will continue those preparations over the final month before the Games, making sure athletes are in the optimal state of mind leading into competition. The Rio 2016 Olympics begin on Friday, August 5, followed by the Paralympics on Wednesday, September 7. Follow along with CSI Pacific on Facebook and Twitter for news and information about BC-based athletes competing at the games.